We've all heard that smoking causes lung cancer, and baby boomers especially are well aware that smoking leads to wrinkling. But did you know that the list of diseases strongly associated with smoking gets longer each year? Smoking takes its toll from head to toe. And if you think you’re safe because you’re young, guess again. As you tour the body here, keep in mind that this is a list of specific diseases. It doesn’t talk about general health. For example, if you smoke and end up needing surgery for a condition caused by smoking, your ability to heal will be inferior to that of a non-smoker. And if you have pain for any reason – smoking-related or not – it appears that smoking can make that pain worse. Can Smoking Make Pain Worse? Let’s take a look at some of the diseases that are associated with smoking. Headaches are bad enough, but the risk of a stroke or Alzheimer’s disease would make me think twice before lighting up. If you smoke and drink alcohol, check out the smoking cessation programs at the bottom of this article. 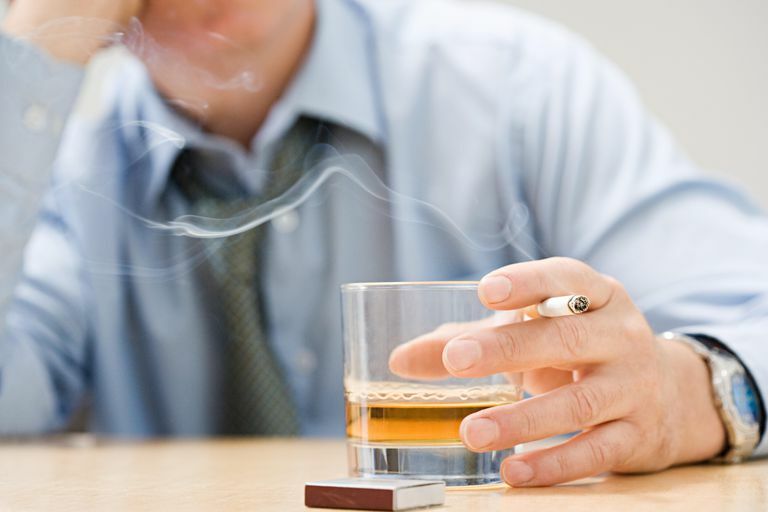 The combination of smoking and alcohol can be more than additive when it comes to damaging your health. An increased risk of cataracts is bad enough, but people who smoke have four times the risk of developing macular degeneration, the leading cause of blindness in the United States. The effects of smoking on your mouth go beyond bad breath. Oral cancer is six times more common in people who smoke. Smoking affects the head and neck in many ways, from causing cancer to disrupting the thyroid gland (a gland some people call the "thermostat of the body." Your lungs are certainly at risk if you smoke. Many of these conditions are ominous, but smoking may also increase the risk of developing chest colds and other nuisance conditions. Smoking and Breast Cancer – Is There a Connection? There is good public awareness that smoking causes heart disease. Smoking also raises the risk factors that lead to heart disease. Smoking causes pancreatic cancer and abdominal aortic aneurysms, as well as heartburn and ulcers (which can be dangerous). We know that one smoking-related condition is of great concern to men - erectile dysfunction. The prime-time TV commercials we watch tell us so. But the effects of smoking on the male genitourinary and reproductive systems may go beyond erectile dysfunction and impotence. Can Smoking Cause Prostate Cancer? From early menopause to infertility, smoking takes its toll on a woman’s reproductive health. You might not think that your leg pain or back pain could have anything to do with smoking, but think again. There isn’t a lot of research on the effects of smoking on mental health – with the exception that smoking is addictive. But new studies suggest that smoking may cause depression in teens, a big concern considering that suicide is a significant risk in this age group. For adults, smoking may increase the risk of divorce; and anyone who has been through a divorce understands the anxiety and stress that divorce can cause. What Cancers are Caused by Smoking? Stavrou, E. et al. Maternal smoking during pregnancy and childhood cancer in New South Wales: a record linkage investigation. Cancer Causes and Control. 2009. 20(9):1551-8.